TotsMobile introduces BugMath, a colorful and educational iPhone game that uses Singapore’s math principles to teach young kids core math concepts. Los Angeles—Bugs: they’re creepy and crawly. Aliens: mysterious and fearsome. But bugs and aliens no longer have to be a source of fright and terror for your kids now that TotsMobile has launched BugMath, a fun and educational iPhone game that teaches children ages 3 to 6 fundamental math concepts. BugMath stands apart from all other kid’s math games in the App Store since it teaches kids math via Singapore’s math principles. Since the math curriculum of Singapore consistently ranks in the top three of curricula worldwide, TotsMobile incorporated the country’s counting, addition, and subtraction principles into the game. In particular, BugMath teaches fundamental math concepts in a graduated format, beginning with counting with the aid of visual cues and progressing on to show the correlation of these objects to numbers and words—and later on, number ordering and basic addition and subtraction. BugMath introduces children to Ug-ug, a friendly young alien who loves math. Ug-ug accidentally crash-lands on the mystifying planet of Aliennz, which is completely inhabited by bugs. Kids can help Ug-ug escape his buggy foes in BugMath’s five games by utilizing their counting, addition, subtraction, and memory skills. 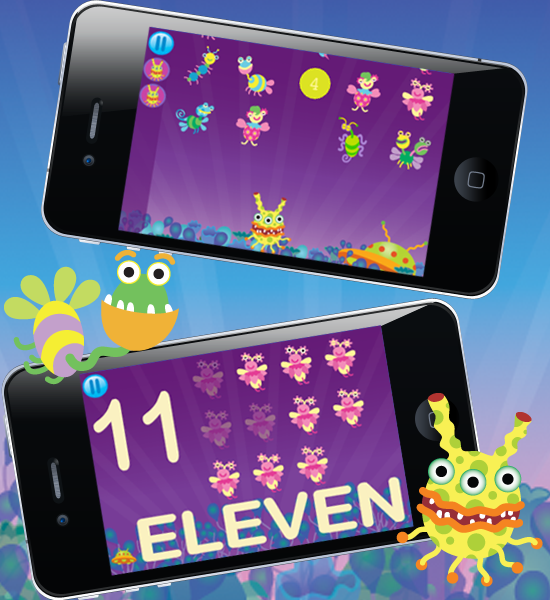 Young children can start their adventure with Ug-Ug in the Counting Game, which teaches double-digit numbers. Then kids can move on to Big & Small, a game with bugs of varying sizes that must be sorted sequentially or in reverse order. There’s also Plus Minus Bugs, which aids kids in learning basic addition and subtraction. In Bug Attack, a voiceover will count the number of bugs the user zaps, while in Matching, the user will use their memory skills to pair up the hidden bugs. 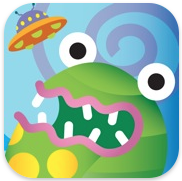 In every game, Ug-ug is the perfect alien buddy to help your child enhance his or her math skills! Five fun games included: Bug Attack, Counting Game, Big & Small, Plus Minus Bugs, and Matching. Teaches number recognition, sequencing, and logical thinking through visual and auditory clues—all in a fun and engaging way! Easy-to-use, intuitive interface designed to help develop fine motor skills in young children. Colorful, vibrant graphics and an all-original soundtrack. Unlimited replay and educational value! BugMath is $1.99 and available worldwide exclusively through the iTunes App Store in the Education section. About TotsMobile of Zixxe Pte. Ltd.
TotsMobile is the children’s brand of Zixxe Pte. Ltd., a transmedia company that produces quality content for various platforms, ranging from film and television to interactive mobile. Under the direction of Zixxe, TotsMobile produces entertaining and educational mobile games and ebooks for kids.